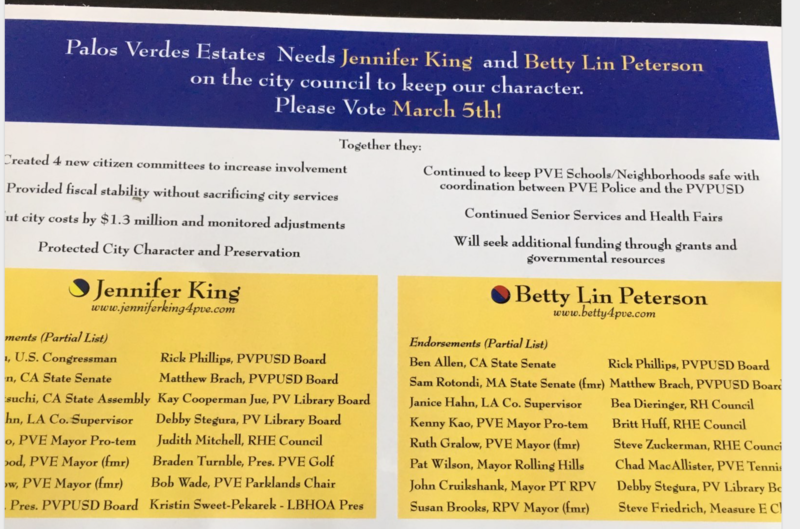 It seems clear now why Joan Davidson spent her own scarce political influence and money on 2019 election mailings supporting King/Peterson's failed campaigns (click here and here). Davidson had criticized both harshly during his own 2017 campaign (click here). However, Joan desperately needed at least one of them to win to secure the second vote for her husband's expected MPT nomination. 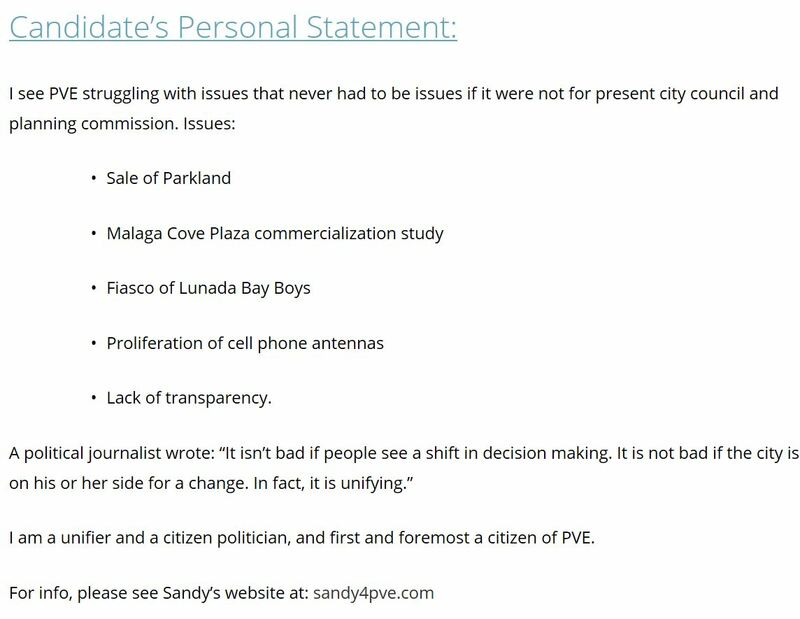 Why won't PVE Councilman Sanford Davidson tell the truth, the whole truth, and nothing but the truth? 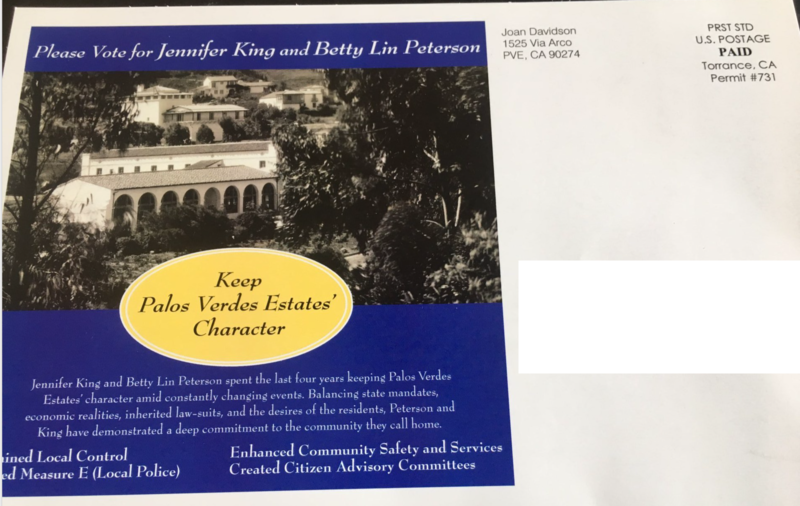 Did Sandy Davidson submit false or misleading information to the City of Palos Verdes Estates for his official biography page (or related published biography)? Investigation efforts and related conclusions began to be published on April 5, 2019. New reports of false or misleading information began streaming into the BCHA following the initial investigation results being published. Anonymous tips assisting existing and prospective investigation targets are encouraged to be sent to jennifer@bluffcove.org. "Dr. Davidson spent 2 years in the military during the Vietnam War." "Dr. Davidson spent 2 years serving the military during the Vietnam War." "He has also served as [the] Admissions Committee Chairman at the UCLA School of Medicine for over 30 years." "Dr. Davidson is a Professor of Ophthalmology at the UCLA Jules Stein Eye Institute." Davidson's claim he "spent two years in the military during the Vietnam War." Please review Description section of video posted online for more details relating to this investigation. 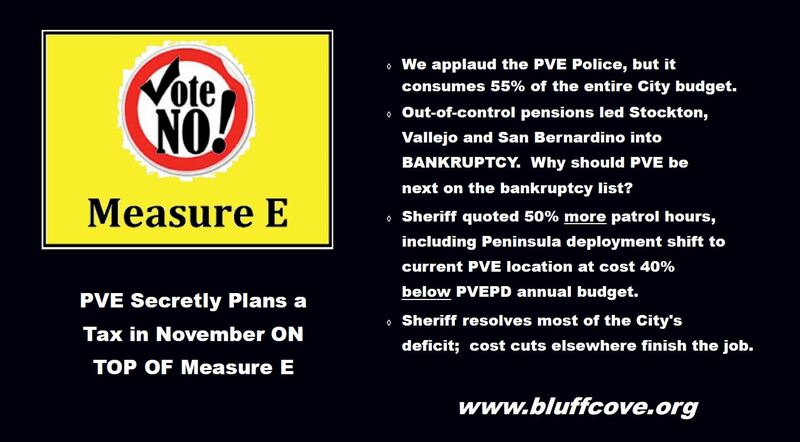 In April 2016, members of the Bluff Cove Homeowners Association (http://www.bluffcove.org) officially called for the resignation of PVE Chief of Police Jeff Kepley based on weak and ineffective leadership. Though it took a year for him to agree this was his best course of action, eventually Kepley went on a "five-week" stress leave that became a four-month "MIA" episode, and then finally, thankfully, an official "retirement" announcement. 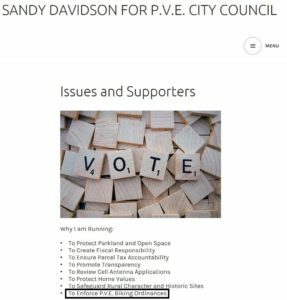 Now, nearly two years later, the Bluff Cove Homeowners Association officially is calling for the resignation of PVE City Councilman Sandy Davidson. 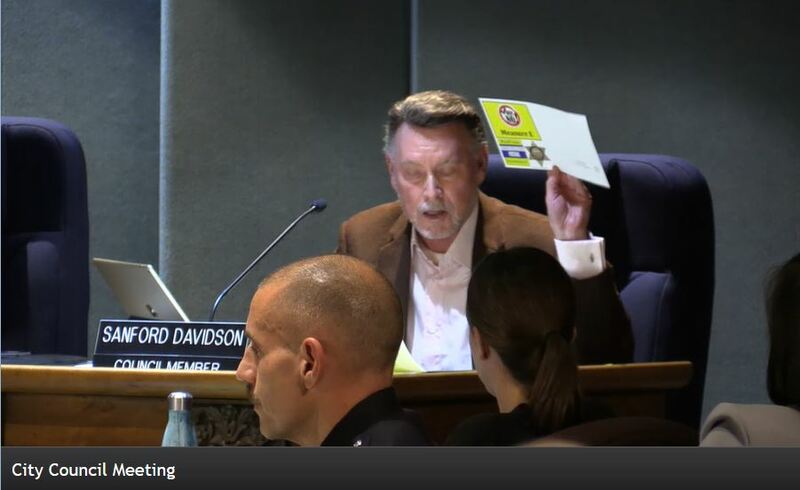 Mr. Davidson is the PVE councilman spearheading the unprecedented $45 million, 9-year Measure E "Law Enforcement" parcel tax (http://www.bluffcove.org/measure-e/). The $5 million/year tax only partially funds (50-67% of $7.5 -$10 million) the PVEPD's updated FY2017-2018 budget (excluding one-time cuts, including non-accrued pension expense). Nonetheless, Mr. Davidson and his wife's unconventional ties to the PVEPD continue to drive their crusade for what amounts to a small "down payment" on an unquantifiable, skyrocketing pension liability. This "pension bomb" is estimated to impair materially our City's balance sheet upon the signing of a 9-year PVEPD union contract, if Measure E were to pass. Thus, essentially the BCHA believes Mr. Davidson recklessly is spearheading a campaign that will lead to PVE's insolvency and related bankruptcy sometime during the PVEPD contract period. Due to the fact that his seat does not come up for re-election in March 2019 as is the case with Councilpersons King, Vandever and Lin-Peterson (http://bluffcove.org/city-council-election/), there is not an electoral means to remove Mr. Davidson for another three years. Thus, as occurred with individuals working assiduously to expose Chief Kepley's lax oversight of the City's law enforcement department, the BCHA has begun its exposé of the lengthening list of Mr. Davidson's breaches of fiduciary duties to PVE residents. Though the documentation and source-linking of Mr. Davidson's credibility and related integrity is only in the early stages, one may find upon reviewing the listed webpage that evidence of his untruthfulness already is abundant. Prominently, the residents of PVE elected Mr. Davidson over Jim Goodhart in no small part based on Mr. Davidson's campaign pledge to protect PVE parkland. However, Mr. Davidson two weeks ago announced he shall "abstain from any future city actions involved in this [Parkland] legal matter." This news has hit PVE residents hard, especially those whose votes were driven primarily by his pledge to do the exact opposite - remain the sure vote against any adverse Parkland decisions by the City. Please review the webpage below for more support underlying the BCHA's determination to assist Mr. Davidson in coming to the same conclusion as did Chief Kepley a year ago. 1) "Does he represent the City's values with dignity?" 2) "Would you vote for him today?" Sandy Davidson's Infamous "Venom Speech"
Sandy Davidson: Of Sound Mind? Sandy Davidson says, "It's all about honesty" (click here at 1:46:30). Fine, let's get honest about Sandy Davidson and his extraordinary dishonesty. I pledge to "protect parkland and open space." Within less than one year as a PVE councilman, Sandy Davidson essentially jettisoned this pledge in order to create harmony with the other four councilpersons seeking to pass the Measure E Parcel Tax. In essence, Davidson sacrificed and sold down the river his first born (PVE Parkland) in order to improve the prospects for his true love - the PVEPD that provides him and the other city councilpersons VIP services subsidized by the other 99.9% of PVE taxpayers. 1) I certainly would never have participated in the creative economics that gave birth to this sale of parkland to a private entity in the first place. 2) I am a personal friend of the man who brought suit in this matter. Therefore, for ethical as well as moral reasons, I will abstain from any future city actions involved in this legal matter." 1) That he didn't participate in the conception, structuring or execution of the invalid Via Panorama parkland sale didn't stop Davidson from using that transaction highly unpopular with voters as a carrot to get their votes. Now that he doesn't need their votes for another 3 years, he doesn't need to put it in front of voters' noses. 2) That illegal parkland sale litigant John Harbison was Sandy Davidson's "friend" before he was elected didn't stop him from using the parkland lawsuit as the centerpiece of his election campaign. Moreover, according to sources, Davidson at the time of his election really wasn't even Harbison's friend; at most, they were acquaintances who sporadically chat about City matters, but not much else. It gets much worse: on January 11, 2019, Sandy Davidson deeply maligned publicly (at the City Council meeting approving a legal settlement) John Harbison as a "litigious, wealthy man with his own agenda … a power hungry lobbyist who has sold his soul … stealing from the PV Homes Association and giving to everyone else on this tiny cul-de-sac of Via Panorama" (click here at 1:12). It has become patently obvious that Sandy Davidson is pathologically dishonest, disingenuous, and disloyal to anyone but himself and his silly little political "career" and even more fragile ego. 3) When it became politically favorable to flip flop again, Davidson didn't hesitate. In January 2019, despite vowing publicly less than a year earlier on February 27, 2018, "for ethical as well as moral reasons, I will abstain from any future city actions involved in this legal matter" (see above), deceitful Davidson did precisely that. Davidson not only participated, but gave a long, ranting speech opposing the Parkland litigation settlement. Worse, during this speech Davidson harshly rebuked this same "friend" John Harbison who he claimed a year earlier was a reason he would avoid all participation in the Parkland matter. It is clear that Davidson saw and jumped at the chance to be able to say in the future, "I was the only one to vote against a settlement that sold parkland to a private individual." The trend with Davidson is clear: he is a politician, thick and through, using popular campaign themes to win an election, but then tossing them aside once he has used those pledges and the voters' gullibility to get what he wanted. Victoria Lozzi (as Treasurer and now Councilperson) is "anti-PVE Police Department." There is no evidence whatsoever that Lozzi opposes or in any way is "anti-PVEPD." To the contrary, she has stated many times that she believes the majority of PVE residents want to keep the PVEPD. 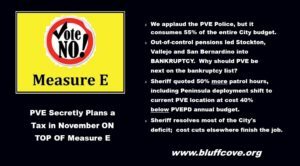 Instead, Lozzi has stated that what she opposed was the structure and misinforming nature of the tax measure (Measure E) designed to fund, partially, the PVEPD. Sandy Davidson is well aware of this, but has used the PVEPD issue as pretext to malign, dishonestly, who is perhaps PVE's most treasured government representative. See video above (Davidson Again Attacks Treasurer). 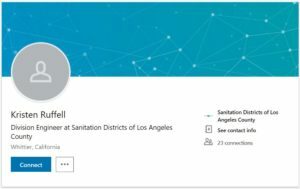 I didn't lock a Los Angeles County Sanitation District employee into a Sanitation District truck on January 6, 2016 (click image below). Here are the facts as we know them. 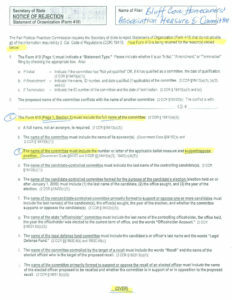 The content almost entirely may be verified by obtaining documents via the California Public Records Act (CPRA). 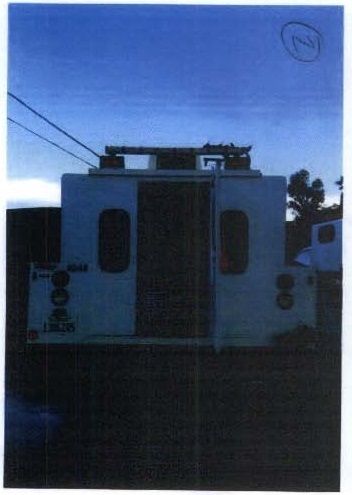 On a rainy day in January 2016, an innocent Sanitation District engineering technician named Humberto was in the back of his Sanitation truck after collecting samples from a monitoring well. A woman he didn't know approached the back of the truck and asked, "Do you remember me?" to which the technician replied he did not. The woman reportedly began to rant, mentioning "pollution," but the technician found impossible to understand nearly everything being ranted. The woman then closed the door of the truck and immediately closed its latching handle. This outside location is the only means by which one can open the closed/latched door. With the truck running and keys in the unlocked cab, the technician was scared. Banging on the door, screaming, "Let me out! Let me out!" had no impact on this woman. He called another LACSD employee using his cellphone, but that employee was excessively distant. Desperate, the employee used his tool kit to dissemble the lock from the inside of the truck, allowing himself to escape. When the employee came back to the office, he described the woman who had locked him into the truck. Someone offered that this sounded like a description of Joan Davidson, who again had been pestering for many years the Sanitation District over unproven claims of soil contamination (Note: it is estimated that Davidson's ludicrous contamination crusade (click here and here) cost over $2 million of taxpayer money). After viewing a video of former high school art teacher Joan Davidson from another episode, the employee believed the woman who had locked him into the truck was indeed Joan Davidson. The LACSD then sent a letter to the City Manager of Rolling Hills Estates, with pressing charges against Joan Davidson taken into consideration. 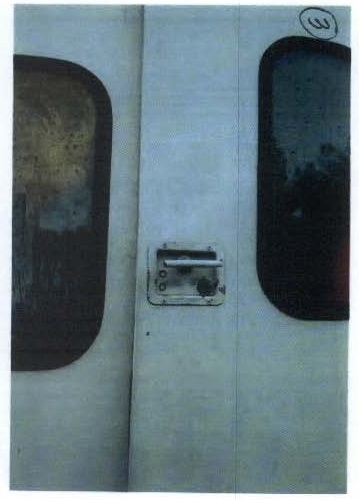 I guess we'll never know for sure if Joan Davidson locked a Sanitation worker in a Sanitation District truck. That being said, a few key points: 1) Both of the Davidsons have very distinct "hair" and faces, making identification from close distance a near certainty; 2) After seeing on the Board meeting minutes the name of the Sanitation District employee who dealt with the allegations, we Google'd her to understand her credentials; it seems unlikely that a longstanding, accomplished Los Angeles County Sanitation District Division Engineer (Kristen Ruffell: click here and here) would back up a fabricated story; and 3) Does this highly detailed episode even slightly surprise anyone who knows Joan Davidson? I pledge to obtain the enforcement of laws against illegal cycling in PVE. Based on a CPRA document request by a BCHA member, the PVEPD has not issued a single citation for a cyclist riding side-by-side obstructing traffic (in violation of CVC 21202(a)) during the entirety of Sandy Davidson's tenure as a councilman. This illegal cycling is rampant throughout our city, with members of the Big Orange Cycling Group flagrantly and illegally riding in "swarms" right in front of the PVEPD HQ on Palos Verdes Drive West. Cyclist groups do this on a predictable schedule on weekend mornings; the ease with which the PVPED could issue tickets to illegal cyclists cannot be overstated. Yet, Councilman Davidson's allegiance truly is with his "private" police department and its officers, rather than to the PVE taxpaying residents who elected him and pay the PVEPD's budget consuming 55% of our City's total. 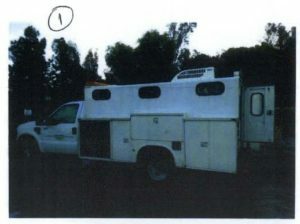 A PVE resident misquoted former high school art teacher Joan Davidson in relation to her aggressive, incessant campaigning for Measure E.
Joan Davidson misrepresented Page 72 of the "McCrary Report" while misusing Nextdoor.com as a campaign communication service, all as part of an aggressive, arguably unethical campaign to assist Measure E's passage. 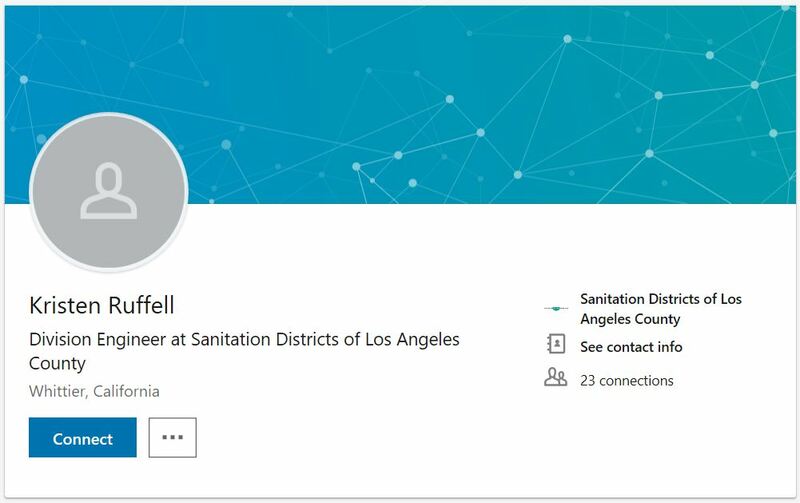 "Dear Councilman: I personally received email correspondence from your wife (that's who said she was on her phone call to me last Tuesday night) forwarding information which were already turned down by the Council quite some time ago (per Dez's post today). You are calling out ND members for misleading voters STRICTLY for the reason of using pseudonyms. However, have you had a chance to have a conversation with your wife and ask why she did that and how many people she had done that to? Please also include her what's been omitted from disclosure to the voters which could influence their vote. Also, thanks for breaking down the math. But, its been stated thousands of times now, that a) there was a shortfall in the budget last year, and b) the pension cost (a long term liability) is not contemplated into your budget. I run a small business, however, my balance sheet reflects my long term debt. Why not simply accept Homan's Challenge on measure "E". We are aware of the accusation that this person is a pseudonym. That's not the point here. We've been waiting for you response. Thanks for engaging in the dialogue." The following was this PVE resident's March 4, 2018 response to Joan Davidson after this city councilman's wife, in an attempt to cover up her attempt to trick this PVE resident into voting "YES" for Measure E, made the false accusation that the PVE resident "misquoted" her. "The council could not go that way and had not gone that way and in fact had turned “that way” down as not plausible months ago, and you omitted that information. You also omitted the other 99 pages. You are not an average person. You are the wife of a councilman, and held to higher standards or you should be. What you did was misleading and wreck less. Regarding my marital status: I don’t know why it’s a topic of ND conversation, but yes I introduced myself and gave you some background information about myself including my profession, where in PVE and how long I’ve lived here, and that I’m not married (among other things). I don’t understand why you took that to mean that I’m deserving of unreliable information." The BCHA's website was launched in early 2018. However, the BCHA was formed in 2008 in response to illegal wedding receptions being held at 605 Paseo del Mar (the infamous "Wedding House"). Many articles (click here) have been written in the Daily Breeze and elsewhere about this problem for our Bluff Cove neighborhood. Please click here to read the most recent such article. Interestingly, the BCHA began in a similar way as did the Malaga Cove Homeowners Assn. Way back when, the Neighborhood Church sought to convert all or part of a parking lot into a social hall for weddings/receptions. The immediate neighbors were concerned but got little satisfaction from the PVHA. It became clear that a unified voice was needed to deal with the California Coastal Commission and other regulatory bodies. And thus the MCHA was born, with Betty Wing as its first president. Sandy Davidson's behavior could not show a higher determination to make sure voters get inaccurate and untrue information to misinform their votes. corrected him, it remains very telling that he could not or determined not to inform voters that the formulaic cost on dwellings added 20c/ft vs. 20c/1000 ft.
Sandy Davidson, during this very same March 27th speech, stated that before determining to join every other Peninsula city by contracting with the Sheriff, the City should complete all phases of a Sheriff Feasibility Study. Thus, Davidson is finally recommending (in the event Measure E fails) the SFS be completed in order to give his prized PVEPD yet a THIRD bite at the apple after Measure D and presumably E failed. There is absolutely NO possibility that the Sheriff contract for PVE will cost more than the PVEPD's massive, 55% consumption of our City's entire budget. First, the City obtained a quote offering 50% MORE patrol service hours than PVEPD's current deployment for a cost 40% BELOW the PVEPD's updated FY2017-2018 budget. 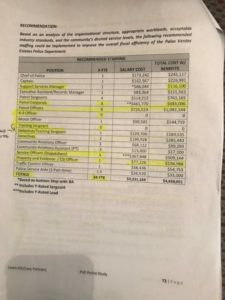 Second, a year later in 10/2017, PVE's very own City Manager Tony Dahlerbruch stated in an official staff report, "the contract alternative of the Sheriff's Department is generally estimated to be $3.5 million to $4.5 million." Lastly, it is ludicrous even to consider as possible, much less probable, that PVE's Sheriff contract ever would exceed the PVEPD's $7.5 million/year cost given that RPV has a $6.1 million/year Sheriff contract successfully protecting its geography and population at three times PVE's size. The BCHA never has submitted any application of any kind to any governmental entity. 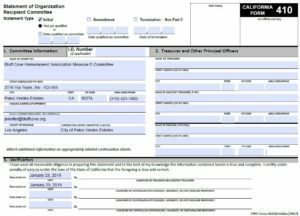 There is no requirement whatsoever for the BCHA or any other HOA to "register" or "apply" with any California state agency if not attempting to qualify as non-profit for tax purposes. Therefore, and to be clear, the BCHA never has applied to the State for anything. The BCHA did file with the California Secretary of State a "Form 410." This is where Councilman Davidson engages in his customary falsification of a truth and contorts it into a defamatory lie to serve his personal interest. The Form 410 is a "Statement of Organization Recipient Committee" (click here), and nowhere close to an "application" (which Davidson full well knows). The word "application" does not exist at all on this form, because it is not an application. 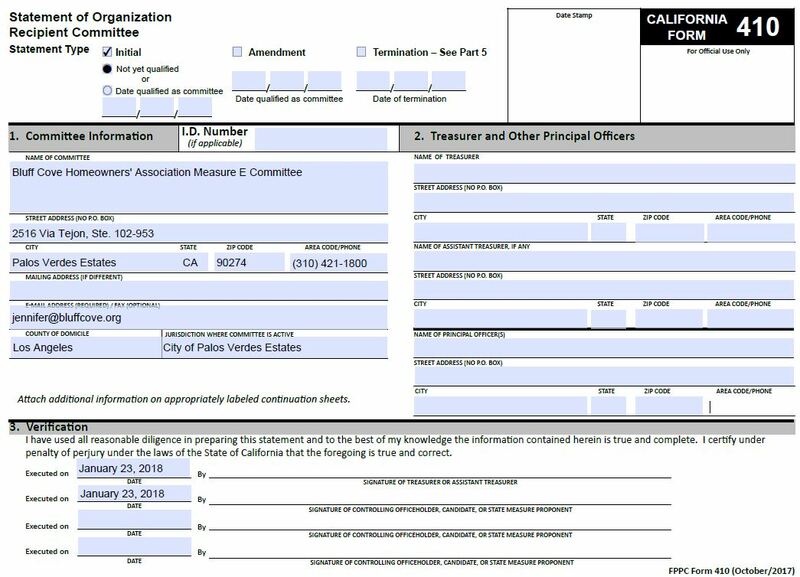 When the BCHA submitted to the PVE City Clerk on January 23, 2018 its statement against Measure E to be considered for the April 10th ballot, a Form 410 was listed as an item that could be included with that submission. 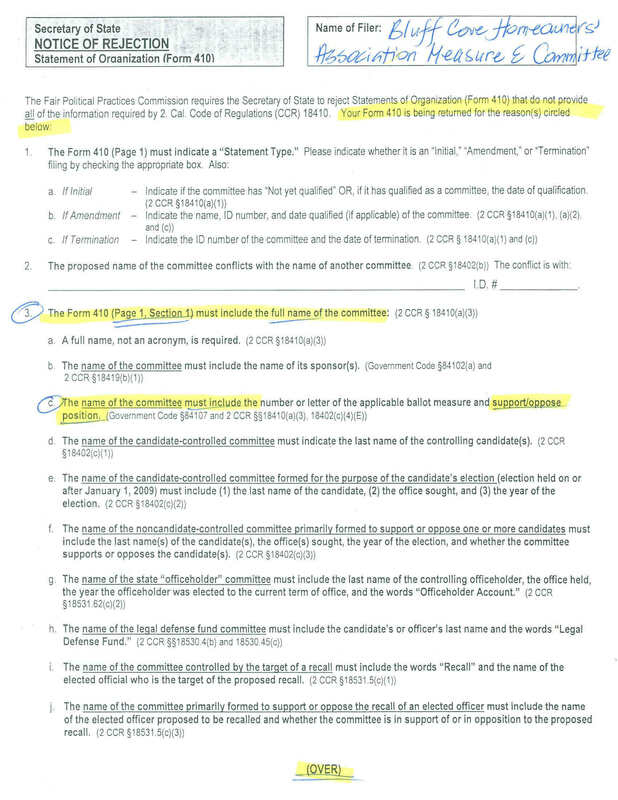 A simple clerical error (the word "Opposition" was not in the Committee Name; click on image) led to the form being returned to the BCHA for correction. The Form 410 was returned to the SOS with the word "Opposition" added, and of course it was acceptable. Do not expect Sandy Davidson to issue a correction to his false statement, now or ever. A legal demand letter does not require a lawyer's signature to be a valid legal demand. This is obvious and intuitive. The Deputy City Manager and head of Code Enforcement, Sheri Repp Loadsman, sends perfectly valid letters demanding legal compliance with the PVE Municipal Code every single week. Whether it be the Telecommunications Act of 1996 (see video below), U.S. Copyright law, or the laws underlying defamation, it is becoming increasingly clear that Sandy Davidson makes a habit of "winging it" when it comes opining on the legality of various actions. Perhaps Sandy Davidson, apparently exhausted by the underestimated demands on a City Councilperson, should think long and hard about hanging it all up and slilding gracefully into fulltime retirement. The BCHA was issued a Cease & Desist "order" by the LASD legal dept. for "illegal mailings" and website in opposition to the PVE Measure E Parcel Tax. No order of any kind ever has been issued vs. the BCHA. Importantly, the LASD's legal dept. can't issue an order; only courts issue orders after evidence is presented by both sides of a dispute. Since this is an alleged "tort," there can be no "prosecution" of any kind by any court, much less the LASD. Instead, the BCHA simply has received "notices" (not "orders") in which baseless allegations were made. 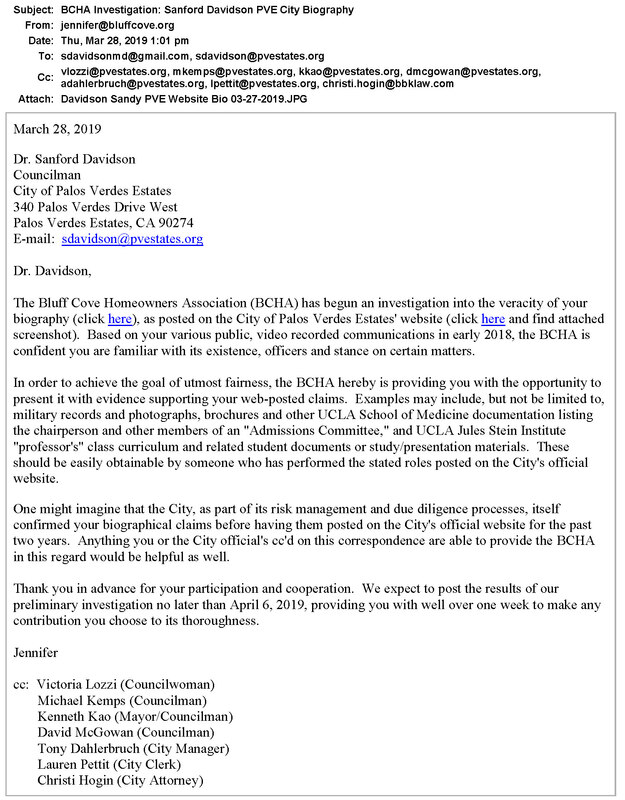 In rapid response, the BCHA replied to the LASD (click image below), making a legitimately irrefutable case debunking the LASD's false allegations. Moreover, in the spectrum of legal issues, the claims made in this instance are "Rated G." Here are the true facts: the BCHA proudly has endorsed the Sheriff (click here for video slideshow) and its $4.5 million quote (40% lower than PVEPD budget) to protect PVE with 50% more patrol service hours than the PVEPD's current deployment (click here for video slideshow). 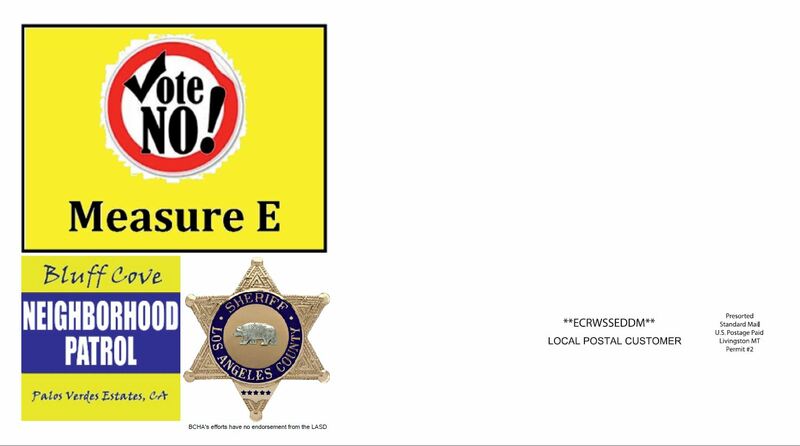 Consequently, the BCHA's website and postcard mailer contained images (e.g., LASD Sheriff badge; click on postcard image) that the LASD, unfortunately, misrepresented as restricted from BHCA use. However, the "Fair Use Doctrine" provides an exception to U.S. Copyright law that clearly supports the BCHA's determination to utilize these images. As a result, the BCHA continues to disagree vehemently with the LASD's purportedly sincere yet highly misguided assertions. Moreover, to date the LASD only has provided trademark documentation for its LASD badge image; no other image trademarks have been documented. Please click on image above to read the BCHA's legal response to the LASD's legal counsel. Clear and Conspicuous Disclaimer: On March 13, 2018, Sandy Davidson continued to abuse his position on the City Council and disrespect the time of his fellow councilpersons and audience by seizing control of the pulpit to pontificate again on a BCHA-related matter. 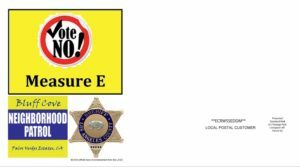 This time, it was to dramatize the BCHA's perfectly legal, fair use of the LASD sheriff badge image in the Measure E postcard (see images above). The legal standard for disclaimers is that they are "clear and conspicuous." In the case of this postcard, the disclaimer is perfectly clear and located conspicuously right under the image itself (rather than footnoted with an asterisk that would require the reader to search elsewhere). Davidson, with typical hyperbole and bravado, claimed he would give $10,000 to anyone who could read the disclaimer (click here at 16:15). The ease with which this test could be passed was so obvious that almost before he finished making his offer, PVE Mayer Vandever himself responded aloud, "I'll take a shot at it." Realizing his bluff had been called by his own fellow councilman, Davidson responded, "Please, nobody take me up on it." Why does Sandy Davidson insist on making knowingly and recklessly false statements about those who oppose his views and judgment? Identity of Postcard Sender Perfectly Clear: The addressee side of the postcard contains a large Bluff Cove Neighborhood Patrol image. The clear and conspicuous text under the Sheriff badge image disclaimed any endorsement of the "BCHA's efforts" by the LASD. The front of the postcard's largest font content was "www.BluffCove.org." The fact that Sandy Davidson himself immediately understood the identity of the postcard's sender itself attests to the invalidity of any claim that hiding the sender's identity ever was intended, much less accomplished. Anyone seen this fraud Sanford Davidson ophthalmologist’s latest attempt to trick people into thinking he served in the military? Get a load of this: looks like the pressure from Bluff Cove and others forced him to change his biography on the PVE website. But the P.O.S. couldn’t come clean – he just had to keep playing dirty. Old version: “Dr. Davidson spent two years in the military during the Vietnam War”. New version: “Dr. Davidson spent two years serving the military during the Vietnam War”. You kiddin’ me? This scoundrel KNOWS that using the word “serving” near “military” will make readers think he “served in the military”! There can’t be a worse stolen valor douchebag in the entire state. Thank you for spotting this. 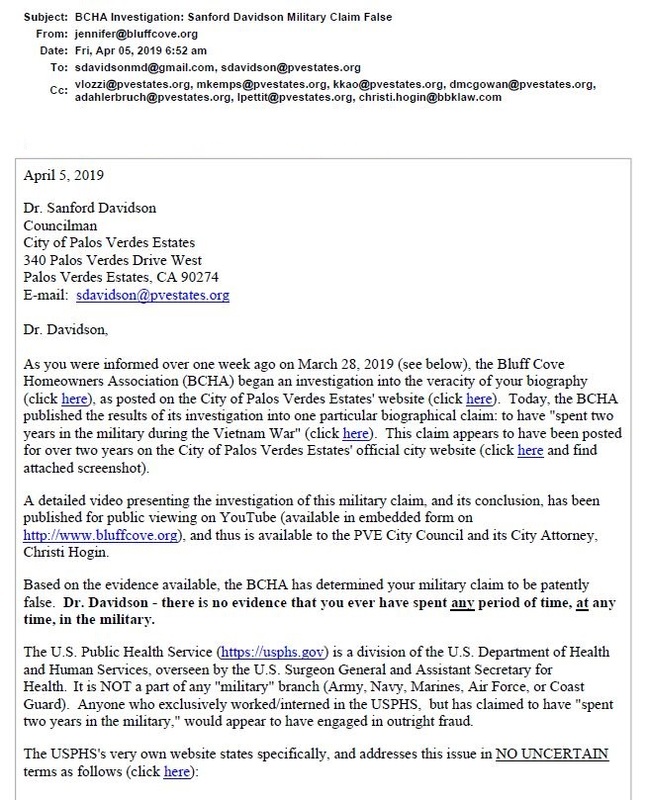 The BCHA resultingly has launched Part II of the investigation into Sanford Davidson MD “Stolen Valor”. Results are expected this month. Well, there you have it folks: Sandy Davidson essentially admitted he didn’t “spend two years in the military during the Vietnam War”. He is a confirmed fraud. Watch http://pvestates.granicus.com/MediaPlayer.php?view_id=1&clip_id=1167 and go to 0:22:00; watch through 0:30:00. At 0:22:40 you will see Davidson interrupt a public speaker/military veteran, Bill Patton, who actually is cutting Davidson some slack by only asking him to remove the false military claim. Davidson, knowing that this true military veteran is calling out the fraudulent one, then tries to discredit Patton with the lame angle that Patton doesn’t live in PVE. At 0:25:00 Davidson gets his shot to try to defend himself, but fails miserably by wheeling out his Veteran card. ((https://www.youtube.com/watch?v=tf6cgIJNgb0): holding a Veteran card from USPHS doesn’t make one a “military” veteran. Davidson has to admit, honestly, finally, “I served two years in the U.S. public health service” – CORRECTING THAT HE STATED HE SPENT TWO YEARS IN THE MILITARY. Again, to be clear, Sandy Davidson admitted (and even apologized for lying) that he did not spend two years in the military. Sandy Davidson admitted, kinda accidentally, that he didn’t spend any time in the U.S. military. Sadly for Davidson, the Bluff Cove video (https://www.youtube.com/watch?v=tf6cgIJNgb0) was well prepared in dealing with that predictable effort by Davidson to mislead PVE voters again. 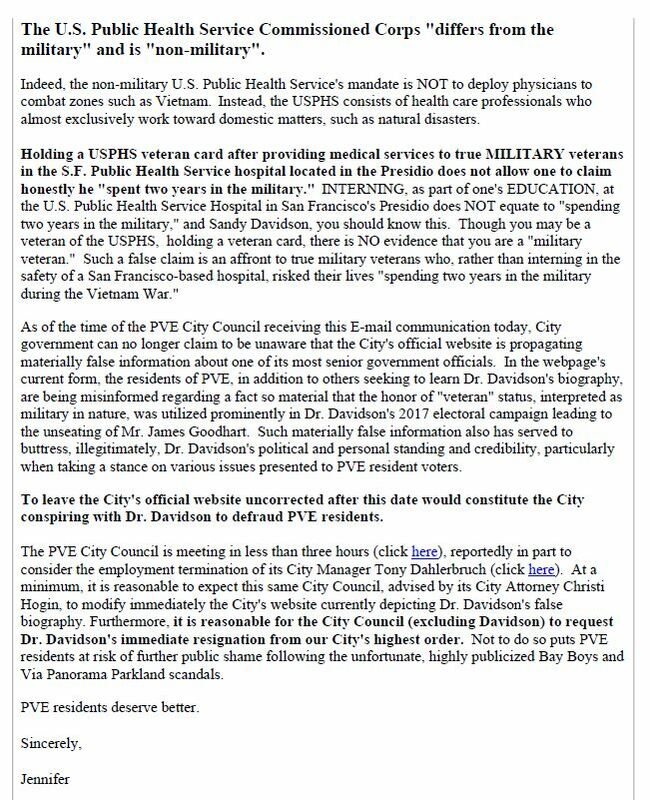 The video makes crystal clear: Davidson may be a USPHS veteran holding a veteran card, but that does not allow him to state honestly he “spent two years in the military during the Vietnam War”. No, Sandy Davidson, it is NOT a “matter of semantics” as you stated! Spending two years in the military is a matter of life and death! You tell someone who spent two years in the military during the Vietnam War that the difference between him/her and you – guy who interned, as part of his education, in the USPHS hospital safely located in San Francisco’s Presidio district – is “SEMANTICS”. Sandy Davidson is a fraud. His wife Joan is his co-conspirator to defraud PVE voters and others. Period. End of story. Thank GOD he never shall (yes, that means “will”) be mayor of PVE. You make some astute observations. Importantly, you correctly pointed out what the Bluff Cove (BCHA) investigation video (https://www.youtube.com/watch?v=tf6cgIJNgb0) also makes clear, repeatedly and specifically. Davidson may hold a USPHS Veteran card that he flashes when pressed, BUT that card does not establish him as having “spent two years in the military during the Vietnam War.” Bluff Cove never, ever claims that Davidson is not a “veteran;” instead, the BCHA claim proven true is that Davidson is not a “military” veteran. To the contrary, as Maj. Patton pointed out, the USPHS (and NOAA) is a non-military uniformed services. Again, Sandy Davidson never “served in the military” during the Vietnam War or otherwise. Davidson concludes his failed effort, in typical fashion, with another lie: Davidson claims: “All of the material on the Neighborhood Watch [BCHA] by your handler will be put to rest.” No, Sandy. ALL of the material on the BCHA website about your false military claim was JUST CONFIRMED AS TRUE by non other than YOU, Sandy Davidson. Sandy, you never spent a single day “in the military” and you just admitted it video recorded format for the world to see forever. Now you are at risk of the wrath of true Vietnam military veterans who learn of your heinous act of deceit. Sandy Davidson is liar of epic proportion. He claims he is a “Vietnam veteran,” right? Really? The armed forces are the Army, Navy, Air Force, Marines and Coast Guard. He didn’t serve in any armed force. He had some cushy internship in a San Fran hospital, maybe at risk of getting scratched by a tree branch in the parking lot and while real military veterans were getting shot and tortured. What a total scumbag. How has the city not taken down this lie yet? As Jim Gordon (https://www.quora.com/profile/Jim-Gordon) explained, uniforms are worn by officers of the Commissioned Corps of the Public Health Service. These individuals are not members of the military; rather they hold commissions as members of a “uniformed service”. Jim’s got it exactly right. This guy Davidson looks like he WAS in the “uniformed service” of the US Public Health Service. However, of the seven uniformed services, only five are military (Navy, Army, Marines, Air Force, and Coast Guard). NOAA and USPHS are, without question, non-military. So this Davidson wants all the glory and accolades of having “spent 2 years in the military” without any of the risk of life or limb that came with it. If I was a true military veteran, I’d be beyond furious if PVE doesn’t take down his lie. What may be the most telling of all the insanity shown by Davidson in the videos is during his April 9, 2018 “Venom speech” he says “one of them sitting with here us TONIGHT”. He was speaking at around 9 IN THE MORNING. At 1:05:00 the Mayor even says, “We wan to thank everyone for coming out early today …” WTF is wrong with this guy Davidson? Also at around 1:01:30 you can see the crazy illogical misleading explanation for not ordering this Sheriff study as offered by the Mayor Mr. Vandever. Vandever is either a fool or thinks his audience is a bunch of fools. He wants people to think the Sheriff would cost MORE than PVEPD ($7.5 – 10 million/year) despite the City Manager himself repeatedly writing that it would cost at most around HALF as much ($3.5 – 4.5 million/year). It’s all a bunch of nonsense covering up that the old timers in PVE want to have a police department at twice the Sheriff cost but that does half the job by selectively enforcing laws or doesn’t enforce them at all. That is how you got the Bay Boys lawsuit. It states clearly on upper right that time of meeting is “9:00 AM”. All is not well with Sandy Davidson. OK. Let’s just get this said now before the investigation comes out on Friday. IF Sanford Davidson did not “serve in the military” but he had that on his biography. he has to resign. The City cannot go through more embarrassment of this man. He must go. This webpage is AWESOME. What democracy and the good fight against evil is ALL ABOUT!!!!! Davidson will resign unless he’s a stubborn fool. Next city council meeting what does he expect? If the Mayor nominates him again, both will look like fools. More silence by the other three and then someone else gets nominated, right? Time for Sandy to get out of Dodge. What were these two clowns thinking nominating Davidson w/o knowing if one of Lozzi, McGowan or Kemps was going to 2nd it?????? Pure f’n genius, folks. Just ended up making Kao look like a moron and Davidson like a pariah. This guy Kao is Mayor, with this unreal bad judgment??? Holy cow. Sanford Davidson has no chance to be re-elected. He is the most hated man in the entire city of PVE. Plus, he is a failed doctor and “citizen”. Did he even REALLY serve in any war? I hear “NO”. Word around town is that Sandy Davidson has formed an alliance with David McGowan, new councilman. They plan to oppose together anyone looking to replace the Police Department with the Sheriff. Figures – two old fogies with nothing left in their lives but acting like big fish in a tiny puddle of mud (PVE). This POS Sanford Davidson is next to get voted out of office. If Jennifer King couldn’t keep her seat, and she was highly considered by many, a plebian loser failed doctor wearing brown Kmart suits is never gonna get elected again. 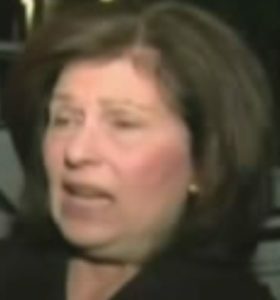 Has anyone seen ol’ washed up Sandy’s mental wife on Nextdoor trying to soften her crusty, corrupt image lately? Yeah, all kinds of thanking this and that and ol’ grandma stuff. Nobody’s falling for it. She’s a crock pot. Did anyone happen to see the lunacy of Sanford and Joan Davidson a the PVrrg city council meeting this week? Holy *)#*&!!! First they walk around putting silly little envelopes on each seat, trying to campaign against Victoria Lozzi by saying PVrrg is biased (well, yes – the Davidsons are right there. 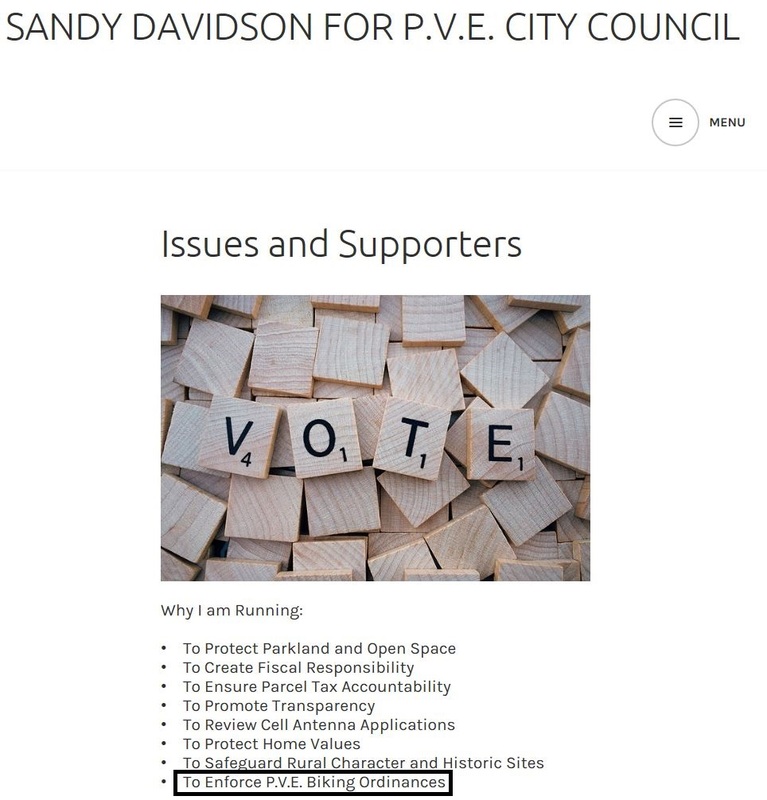 PVrrg probably wants a councilperson who is unlike Sandy Davidson: someone who is not DISHONEST, who is not MENTALLY FEEBLE, and who is not TERRIBLY UNCIVIL). They weren’t done yet. Next Sandy gets into a squabble over where he can place his own videorecording camera. Sandy wants to block the audience by putting in the middle, and then threatens to involve the PVEPD (who he’s in bed with) against John Harbison. Then Sandy Davidson is chirping away during the debate. He just can’t keep his ignorant big mouth shut. The good news? He’ll be gone in a year – zero chance he’s re-elected in 2020. Sandy Davidson is BAD NEWS. His inner anger (from a life of failure it seems) pours out of him uncontrollably. Odds of his re-election in 2020 are close to zero. Is there a recall procedure that can be used against Sandy&dusty?? Yes, there is a recall procedure. 20 votes on petition to start the process, but then around 25% of registered voters have to sign the final petition to get rid of him. Thus, around 2,500 or so signatures needed to rid PVE of him. This is probably too high a threshold. Sandy Davidson appears to be a fraud, based on the massive disparity between what he has claimed about his background and the truth. Word around town is he failed as a doctor, which would explain why he lives in a run down ghost house on perhaps the worst street in PVE and wears a tan Sears/JCPenny leisure suit. His wife, Joan, is far worse than portrayed on this webpage. Ask Glenn Tanner what happened at the post office with his Measure E cards, and how the FBI was asked to investigate Joan Davidson. There is a reason she has been jettisoned off to Nextdoor.com to complain about the school system and off the School Board. Kinda sad pair of people, to be honest.